Spent 56 minutes on this one. It's Shurael again. I wanted to do a fully equipped full body pic so I could print her out and make a little paper cutout figure to use in place of a miniature when playing DnD. I should do a second one showing her from the back so I can make it two sided, and colour it of course. 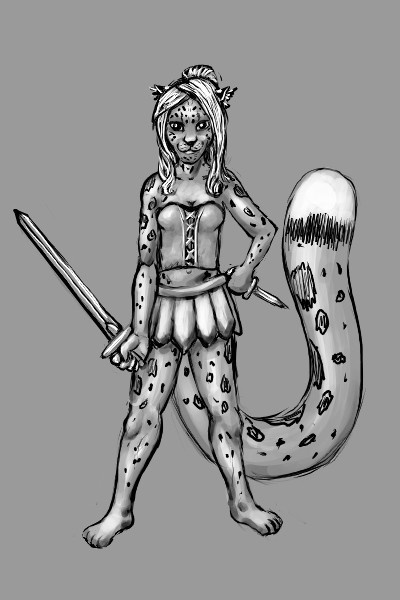 Not entirely happy with her I drew her sword hand, but after re-doing it a couple of times I decided to just leave it be. I made her head a bit too large to be realistic, but I think it looks okay anyway. Gives her a kind of cute, innocent look.